In the shadow of the Koutoubia Mosque, step into a tranquil oasis and breathe in the scent of fresh oranges. La Villa des Orangers is an enchanting Riad in the heart of Marrakech, where peaceful courtyards provide the perfect antidote to bustling souks. The 27 rooms and suites of this charming Relais & Chateaux property are arranged around beautifully tiled patios and offer mesmerising views over the Ochre City. A place where time stands still, enjoy the peace and quiet as you lounge by the pool, enjoy a bite to eat beneath the garden pergola – or indulge in the ancient Moroccan tradition of the hammam. Lying just outside the medina walls, a mere 15-minute private transfer from the airport, Villa des Orangers offers total tranquillity without missing out on any of the action. Just a short stroll away, you’ll find yourself amid the hustle and bustle of the iconic Jemaa el-Fna square, with its snake charmers and market-sellers, before losing yourself in the narrow, labyrinthine streets of the medina. The air here positively swirls with the scent of rich spices, so stop off at the souk and stock up your spice cupboard – you’ll be cooking up a storm at your next dinner party. Honouring traditional Moroccan style, the 27 rooms and suites at Villa des Orangers are adorned with rich fabrics and warm colours that come together to create a cosy atmosphere. No matter whether your room opens up onto a private terrace or a quiet courtyard, you’re guaranteed a peaceful retreat in the heart of Marrakech. We love the Master Suites – set over two floors with a private terrace, it’s your own private getaway. To really feel at home though, opt for the Private Riad. Two suites arranged around a private pool, shaded by banana palms? It’s the definition of dreamy. You really can’t visit Marrakech without experiencing the hammam. 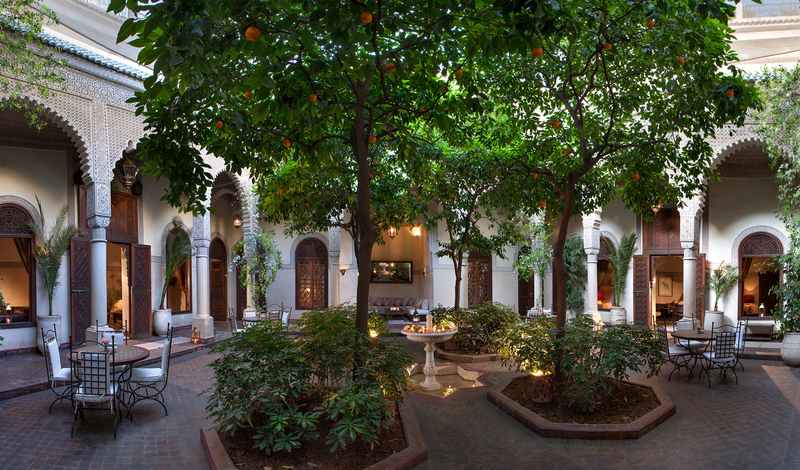 Tucked away off one of the hotel courtyards, discover the soft scent of rose petals and orange blossom in the Nuxe Spa and get a sense of the magic and mystique of Moorish culture in this most ancient of traditions. Stretching out on the warm marble of the hammam, your kessala (hammam therapist) will gently exfoliate your body in this enchanting ritual that guarantees total relaxation.